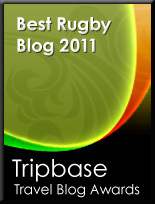 TOTAL FLANKER...a rugby blog: Stranger than fiction? It is fairly clear that the IRB loves and adores NZ. Hope that passes when old One-Eye o'Brien moves on. As a test of the IRB's insanity I'd like to see Scotland come up with some bizarre chant and dance, and then have Wales advance on them and see if a similar fine is applied. Fully agree with you Flanker. Pleased the England Women took a step forward, should have been more though. Also agree with annonymous. Perhaps England, Men and Women, could adopt a suitable "traditional" performance. I have in mind perhaps Morris Dancing. Northumberland has produced some excellent dances involving swords, technically known as Rapper Dances, or perhaps The Lambeth Walk, or Hokey Cokey. As far as fines go I would suggest passing a bucket round the ground. There were plenty of people at The Stoop on Womens World Cup Final day who would have willingly paid a quid. Let's get this back in perspective. The Kiwi's can do there face pulling if they wan't but there has to be give and take. Final thought, don't suppose health and safety would smile on an impromptu community conga chain. As a kiwi TF, I'm in two camps here. 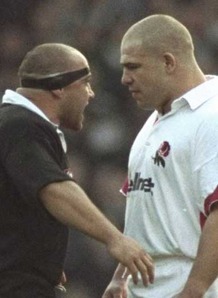 I hate how rugby teams get so precious about the haka. I think it's great when opposing teams offer a challenge, it adds to the drama that surrounds rugby both on and off the field. I personally don't think the All Blacks should do a haka in a visiting country unless they're invited to. On home ground, of course we shoud do it. It's part of a tradition that has been going for 100 years now and it's what lots of punters want to see. Speaking of punters, the English/Australia media and true rugby experts (not of NZ heritage might I add) of course hate the haka because they think it gives the ABs an unfair advantage. But everyone I have met in my travels, from the most isolated villages to the biggest cities across the world - all talk about the haka when they find out I'm from NZ. WE're a small country. We're not known much on the world stage for anything else (unless you count hobbits and butter). Surely you can afford us this little luxury? ps - the most fiery, emotional hakas I"ve ever seen the ABs perform (world cups 2003 against Oz and 2007 against France) didn't do much for our cause, did it? You hit the nail on the head Ferdy - it's a luxury. Unfortunately it's treated as a god-given right by the ABs. I don't particularly think the haka gives the ABs an advantage - I just get pissed off with how precious they are about it. Teams shouldn't be dictated to about how to react and if, for example, the WRU wants to sing the Welsh national anthem in Cardiff after the haka then so be it. The ABs should conform to the wishes of the hosting nation just as I'd expect us to conform to the wishes of the NZRU in NZ. Being so damned defensive about the haka will invite more and more criticism - and eventually may result in it disappearing from the game which, imho, would be a shame.